When I say that the tanks are lovingly rendered, I really mean it. The creative team for this show clearly thinks tanks are fascinating machines which deserve all of your attention. Each tank is a distinctly recognizable historical model, with the appropriate technical details happily regurgitated by the requisite tank-nerd character. They have properly sized crews, the right guns, everything. The show does allow for a little extra creativity in the maneuverability department, and I’m really not sure that the gun of a Pz. 38 (t) would be able to penetrate the armor of a T-34-85, but they play it straight for the most part. Play the tanks straight, that is. The setting is wonderfully ridiculous: according to a PSA in the first episode, Tankery is a highly respected feminine art form with a long history, one which will help girls and women become “intense and strong like [a tank’s] iron, adorable like the clattering of its track, and passionate and precise like its main cannon.” This is taken as established fact, or at least is accepted as true by the various characters involved, and is repeatedly played for laughs even though the characters clearly don’t see anything funny about it. In fact, that surreal straight-man comedy is one of my favorite not-in-a-tank parts of the show. 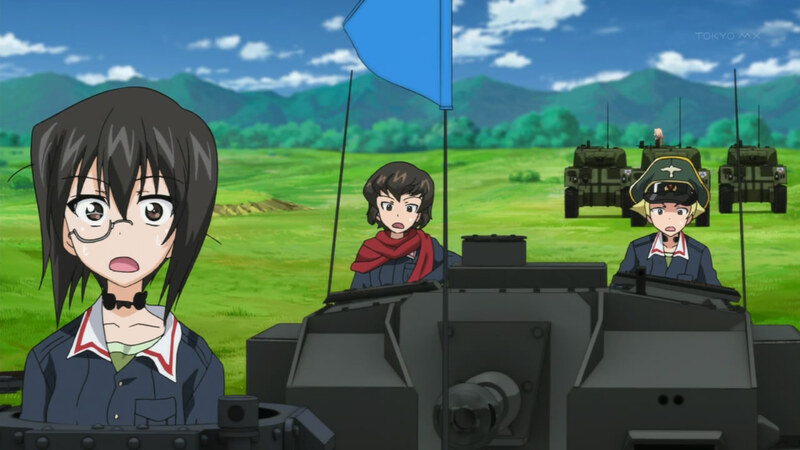 Leaving aside any concerns about reinterpretations of Japan’s military history (which the show simply ignores, along with any hint of actual war), the show takes its premise and runs with it, letting you enjoy tank battles interspersed with oh-so-cute moments of we’re-nice-friends. There are moments of fan service, but they’re usually subdued and are few and far between. If you want fan service, go watch High School of the Dead instead. If you can embrace its adorableness and its strangely compelling tank battles, I’m sure you’ll enjoy this show too. 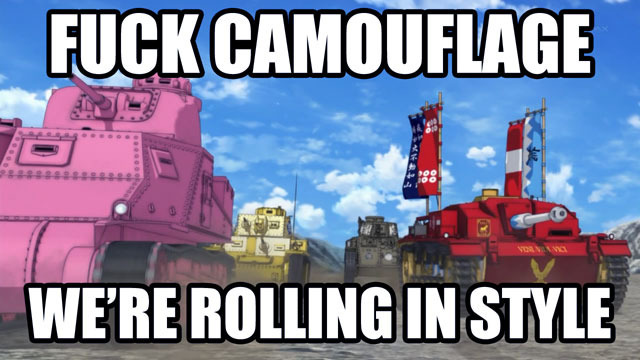 This entry was posted in TV Shows and tagged Anime, Girls und Panzer, Tank. Bookmark the permalink.